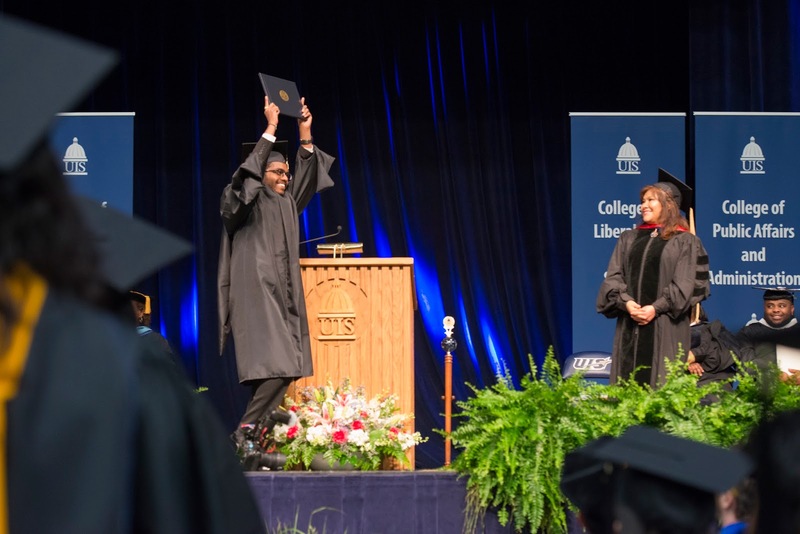 The University of Illinois Springfield will hold two commencement ceremonies on Saturday, May 12, 2018, at the Bank of Springfield (BOS) Center, Ninth and Adams Streets in downtown Springfield. Of the 1,520 UIS students eligible to graduate, 978 will participate in the ceremonies. The doors to the main floor will open an hour before each ceremony. Overflow seating will be provided in the lower level of BOS Center. 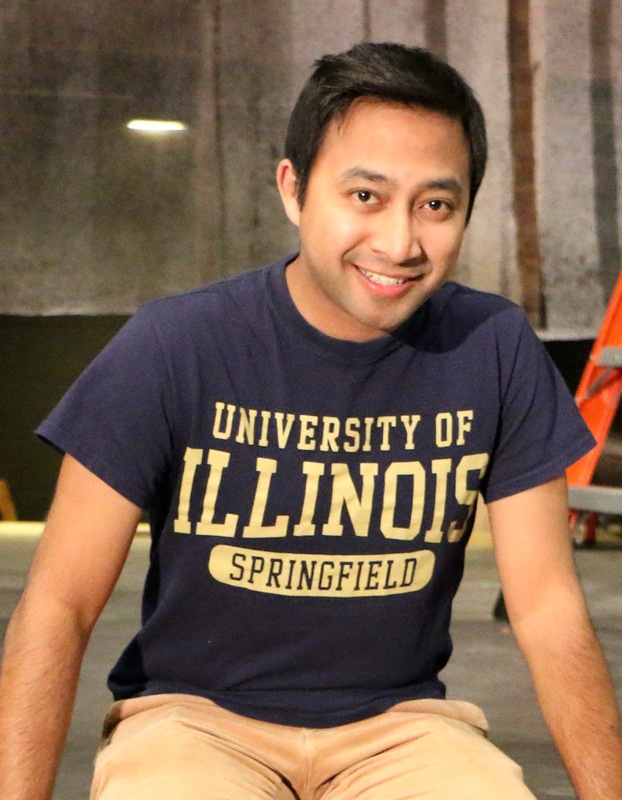 Christopher Vemagiri Marbaniang, who will be graduating with a master’s degree in public health, has been chosen as the student commencement speaker. He was born in Shillong, Meghalaya, India, but calls Tuscaloosa, Alabama home. 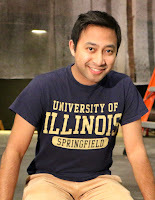 At UIS, Vemagiri Marbaniang has been a cast member for several UIS Theatre productions since 2015, is treasurer of the Student Government Association, chair of the Student Organization Funding Association, a senator on the UIS Campus Senate, vice president of the UIS Public Health Club, treasurer of the Kappa Beta Colony of Delta Kappa Epsilon at UIS and a worship leader for the University Bible Fellowship. He is also a member of the UIS Mock Trial team. Since Fall Semester 2017, he has interned at the Illinois Department of Public Health as part of the Graduate Public Service Internship Program (GPSI). Following graduation, he hopes to combine his two passions, public health and theatre, by becoming a public health educator. He has currently been accepted into several public health Ph.D. programs across the country. Charles Wheeler III, long-time director of the UIS Public Affairs Reporting program, will serve as faculty grand marshal. 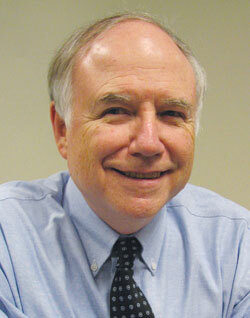 A veteran newsman, Wheeler came to UIS following a 24-year career at the Chicago Sun-Times. For the last 19 years of his Sun-Times tenure, Wheeler was assigned to the newspaper’s Statehouse bureau. During that time, he was elected to 16 consecutive one-year terms as president of the Illinois Legislative Correspondents Association and served for many years on the PAR program and admissions committees. He is a graduate of St. Mary’s University, Winona, Minnesota, majoring in English, and received a master’s degree in journalism from the Medill School of Journalism at Northwestern University. Faculty in each academic program select one graduating student who best exemplifies the goals and spirit of that program to serve as student marshal for the ceremony. Accountancy: Stacey Denise Hall – B.A. (Peoria), Elani Lynn Godar – B.A., Quentin Kuntzman – M.A. Biology: Veronica Onjel Tellez – B.S. Biochemistry: Jacob Thor Hughes – B.S. Chemistry: Nathan D. Maulding – B.S. Clinical Laboratory Science: Taylor R. Cooperider – B.S. Communication: Kayla Renee Nevill – B.A., Mary Beth Williams – M.A. Computer Science: Bradley Michael Neale – B.S., Bhavyanshu Parasher – M.S. Criminology and Criminal Justice: Amanda Marie Mullin – B.A. Economics: Erik M. Thulien – B.A. Education/Teacher Leadership: Amber Renee Brown – M.A. Educational Leadership: Kylee Marie Orr – M.A. Elementary Education: Connor C. Brillhart – B.A. English: Raven Wilson – B.A., Lauren Elizabeth McPherson – M.A. Environmental Studies: Levi William Reed – B.A., Rebecca A. Fiedler – M.A. Global Studies: Luke Raymond D'Elia – B.A. History: Andrew J. Duggins – B.A., Corinne Elizabeth Mayfield – M.A. Human Development Counseling: Jacob Louis Hopkins – M.A. Human Services: Jessica Ellen Carmany – M.A. Information Systems Security: Bryce Combs – B.S. Legal Studies: Mathew Musipa – B.A., Nicole Meyer – M.A. Liberal and Integrative Studies: Crystal Ann Aymer – M.A. Liberal Studies: Toni Beth Johnson – B.A. Management: Melissa Jean Lyons – B.A. Management Information Systems: Nathan R. Cass – B.S., Christopher Barton – M.S. Mathematical Sciences: Joseph A. Bacidore – B.A. Philosophy: David John Millar – B.A. 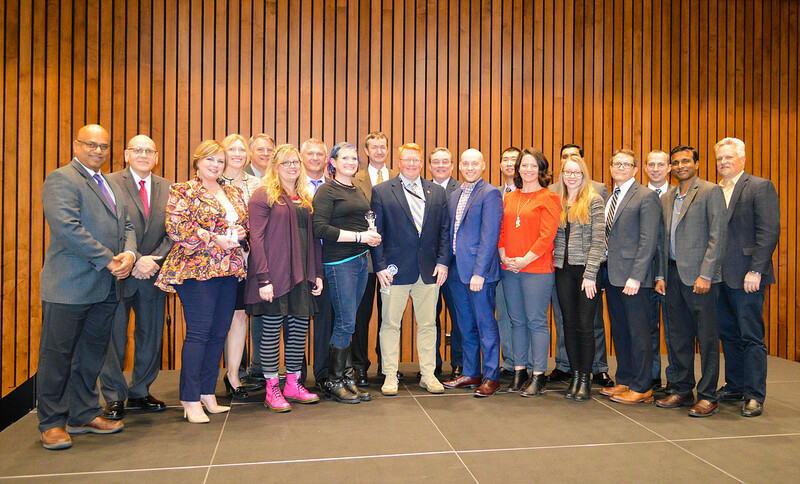 Political Science: Brock Matthew Titlow – B.A., Joseph M. Astrouski – M.A. Psychology: Samantha M. Morin – B.A. Public Administration: Alison Marie Storm – M.P.A., Amy Marie Leman – D.P.A. Public Affairs Reporting: Michael Joseph Miletich – M.A. Public Health: Regina Nneamaka Adigwe – M.P.H. Social Work: Lorinda Marie Guariglia – B.S.W. Sociology/Anthropology: Amanda Jean Buchanan – B.A. Theatre: Colin W. Vancrey – B.A. Visual Arts: Abigail Jean McKinnie – B.A. A number of events are planned for graduates, their families and guests before the ceremonies at the BOS Center. The annual Online Graduates Brunch will be held at 9 a.m. on Saturday, May 12, in the Public Affairs Center. The Capital Scholars Honors Program will also honor its graduates that day with a 9 a.m. brunch at the Student Union.